There are over 500,000 applications for the iPhone and iPad, 300,000+ on Android and thousands more on other platforms. 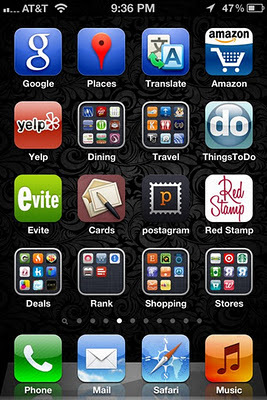 The average user has 65 apps installed on their phone (source: Flurry). Many of us have more. While these efforts are appreciated by app developers and end users alike, they don’t solve what is increasingly becoming a real problem: finding the apps you already have installed on your phone. Before sourcing factual data from mobile analytics firm Flurry as to the average number of apps users have installed on their devices, I did some informal polling on Facebook and Twitter. I asked my friends and followers how many apps they currently have on their phones. The answers were surprising. Although there were a few outliers – the person who only had 10, for example, and a couple of others who have upwards of 300, most people fell within the 40-100 app range. More often than not, they had closer to 50 or 60. Again, this is anecdotal data, but speaks to trends within the tech community. It’s interesting that this non-scientific polling shows that early adopters have roughly the same number of apps, on average, as all smartphone users worldwide – around 65. But how many apps do people actually use? According to Flurry, the average consumer uses only 15 apps per week. That means that the majority of the apps installed on the phone are for occasional use. The games you play while killing time, the tip calculator or bill splitter you only pull out when dining with friends, the calorie counter for that diet you began in January (and again June), the garage sale finder, the photo-uploader, and that game that you kid totally loves…you know, the one with the bunnies? What was that called again? Unless your app is appropriately titled and optimized for search, on-device app search is severely lacking, at least on the two major platforms, iPhone and Android, which I’ll address in this post. For example, in tests on my iPhone, you can’t pull up Groupon or LivingSocial by typing in “deals” into the iPhone’s Spotlight Search box. It doesn’t work on Android, either – you have to type the app’s name. But, oddly, this isn’t always the case. Type in “recipes” on iPhone and Epicurious appears. But not on Android. Type in “deals” on iPhone, and there comes BiteHunter. Type “Shopping” on iPhone, and there’s FastMall and Zoomingo, but not Target or Best Buy. And, in similar tests on Android, apps have to be searched for by name, not function. It appears that some app makers are better than others at maximizing the on-device search capabilities provided by iOS. That is, they’re stuffing their app’s name with keywords. (Epicurious is actually called “Epicurious Recipes & Shopping List,” for example). This is a problem because search is the quickest way to find apps on your phone. After all, (stock) Android is designed so that you’ll hide most of your apps, only pinning favorites to your homescreen. Meanwhile, iOS addresses the app overload situation with folders…ugly and inelegant folders. These solutions, built out of necessity, pale in comparison with an efficient search mechanism. But even as useful as keyword-based searching is today, given that it ranks results alphabetically, it won’t continue to be as useful in the future. I mean, really – results ranked alphabetically! – imagine if that’s how Google ranked the web! Of course, the app store ecosystem is hardly as large as the web. Due to the barrier of entry – the technical requirements, the vendors’ curation process, etc. 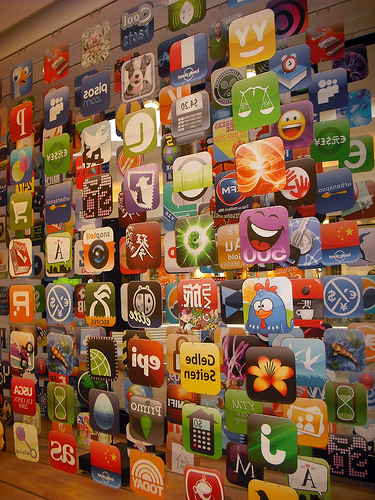 – app stores won’t grow to the web’s size. In time, our app addiction will likely also give way to “app-ified” mobile experiences designed for the small screen, and built with HTML5. (Or so I hope). But the app ecosystem is insanely huge and still growing. In the meantime, users will begin to hit a stopping point with apps – a psychological barrier – not only due to the limited storage space on their phones, but also because they simply don’t have the mental capacity to deal with a phone that has some 500 or 1,000 apps installed. That’s actually kind of a shame. Although it’s a rare day that I feel compelled to check on the sustainability information regarding the fish I’m about order, it’s nice to know that FishPhone is there. And the next time I get into a debate about global warming, I want to quickly launch SkepticalScience. If only I could remember their names! So here’s a crazy idea: give our devices a real search engine – one that’s as powerful as the app store’s engine, if not better. Apps should be keyword-optimized, ranked and rated by dozens of signals. The on-device app search engine should know what apps you have installed, how often you use them, how long you’ve had them, when you bought them, their ratings, your ratings, which of your friends use them, and everything the apps can and can’t do. For starters. On iPhone, Siri could one day be that engine – the way that we “re-discover” the apps we have installed will be through developer integrations with Siri’s engine. You’ll ask a question and Siri will launch the appropriate app. But Siri utopia is a long way out – it is very much an alpha product. In the meantime, instead of downloading every app we like, we should be able to quickly access those apps we’ve deemed our favorites, whether or not they’re on the device we have now. iCloud is a good first step to this – your favorite apps could be stored in the cloud and surfaced through Spotlight Search. And Google, a company that built the world’s best web search engine, could surely do a better job of building an engine for searching the apps on our phones. Unfortunately, we’re getting to a point where, if this situation doesn’t change, then it’s only a matter of time before all of us start to feel the side effects. Some are already there. Without on-device app search improvements, no one will try your new app because they have enough apps already, thank you very much.